By now, a few of you are aware of my attachment to Fancy Fishballs!, a surimi-like product thatâ€™s sold in fancy shapes and colors (like flower and unidentified animal), hence the name. Still, nothing prepared me for what I like to call Even Fancier Fishballs!. Purchased from SM Hypermart, these fishballs are available in a variety of colors and flavors, with some of them even having stuffing! Mostly intended for hotpot dishes, these fishballs are flexible enough for a variety of preparations. Perfect for adding a splash of color to stir-fries and soups, I would think. I have to admit though, when we first spotted it, one thing came to mind. BENTO! â€¢ Ground Chicken in Yakitori Sauce. Since I woke up late, I wanted a very simple dish for the ground chicken I set to defrost the night before. I figured a quick sautÃ© in yakitori sauce would work. It turned out yummy and perfect with rice. â€¢ Rice. Under the Ground Chicken. â€¢ Dragonfruit. A waxy, spiny red fruit with white flesh speckled with lots of seeds. The texture, thanks to the explosive little seeds, is reminiscent of kiwi fruit. Taste-wise though, it’s more like watermelon in its blandnessâ€”just slightly sweet yet, very refreshing. â€¢ Even Fancier Fishballs! The colors and designs indicate different variants and flavors. The green is a fleshy crabstick variant, with an interesting leathery outside. The orange striped one is a crab variant, with a creamy crab-filled center. The yellow striped one is supposedly unagi (eel) with a mush, flavorful yellow center which I assume is unagi. ^_^;; It doesn’t taste quite like the barbecued unagi that’s usually sold in Japanese restaurants and groceries, but it still has a nice, savory taste so I like it. â€¢ A soyfish of Ponzu . I usually eat the Fancier Fishballs! with Ponzu, a soy-Japanese citrus dip reminiscent of Pinoy Toyo-Mansi. They’re really quite similar, though Ponzu has a sweeter, more orangey taste than the tangy sourness of Toyo-mansi’s Calamansi (Philippine Lemon). 1. Saute the chicken in the oil until it changes color. 2. Add the yakitori sauce and continue sautÃ©ing until done. This entry was posted in bento, food spotlight, recipes. Bookmark the permalink. this is so colorful and cute! i love dragon fruit but its so expensive here =( I ate mountains of it when I visited china and still never got enough! YUUUUUUUUUMMMMMMMMM! 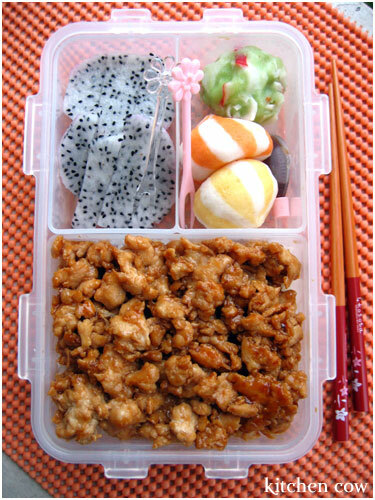 This bento is so colorful! I thought they were candies! i want dragon fruit. and i want those fishballs. It’s expensive here too, that’s why I seldom have it Fortunately, this was a cheaper one labeled Local Dragonfruit at the Super. Still, I didn’t notice a big difference taste wise so it’s a good sign. Plus, these are a tad smaller than the imported ones so it’s better for bento and solo snacking. Ponzu: I love you too khursten! It’s all in the fishballs 😛 You should try stocking some in your condo. Instant comfort food. I like boiling it in water, then throwing them in some instant miso soup I prepare separately. Then eat with a dish of ponzu on the side. It does, doesn’t it? It reminds me of marshmallows and peppermint patties, probably because of the stripey color. I’ll probably start keeping them in the freezer all the time now. It even makes a great instant soup snack. man, this looks good. nakakagutom! I hope you feel better soon. Are your Pinkies taking good care of you? They should! where did you buy those fancy fishballs? they’re so cuteeee! sis! thanks to your blog entry, nag try ako ng balls-balls sa SM! i didnt go for the stuffed ones muna. takot pa ako. i bought the lobster balls, white balls na may shreds ng pink lobster meat… sarap nga sha sis. i deep fried them and they came out really good! thanks! Try mo rin with soup, it’s nice with a fish based soup. I wanted to try the lobster balls too but it was out of stock, only reason why I knew about it was because the salesperson said it sells out fast. And since you said it’s good, I’ll try deep frying it sometime too. yea, thats exactly what i asked the saleslady too. ano ang bestseller nya.. then she said nga lobster ball daw. i make a crisscross slit in each ball para it cooks thru. ill try the soupy style next time. thanks again. Meron bang teriyaki sauce sa sm supermarket?? i want to try it..
Teriyaki sauce? I know they have Kikkoman brand Teriyaki sauce pero I remember not liking it much. Why not try making your own? It’s just Japanese Soy Sauce, sugar plus mirin. I think there’s a recipe here, check out the Recipe Index because I know I listed different versions, depending on what sort of Teriyaki you’re making. wala ako masabi. i’m stil learning all about this thing although I have seen those fishballs too. but i didn’t try buying some since I’ve no idea how to cook them. glad its all here. I just drop them in boiling water. I know a friend tried frying and it tasted good but I don’t find it as pretty, hahahaha! I tried cooking it in soup too, so good! Juicy and the stuffing is soooo….darn. Makapunta nga sa SM Hypermart!